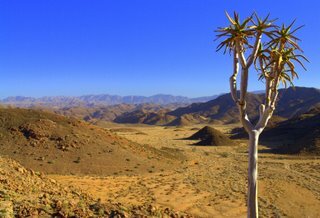 The Richtersveld comprises of a much larger area than the Richtersveld National Park. The area south from the National Park has been declared a world heritage site. There are lots of land recently proclaimed as conservancies where game will be introduced shortly. Currently most of the Richtersveld is used as farmland with the nomadic trek farmers moving along with the best grazing. We work in close relation to the local communities in order that they benefit from tourism as well. They have erected and run some guest houses and other accommodation facilities in order to accommodate tourists. There are several routes through the area with beautiful scenes and interesting people. We offer tours to this spectacular area where we will be your professional guide that will show you the hidden gems as well as supply you with information and history. "Oom Piet van Heerde" the guide's grandfather has been doing tours since 1937 in this area as he spend all of his spare time collecting and discovering succulents in this arid environment. TOURS We offer a variety of tours to the Richtersveld. We present anything from a one day tour to a seven or more day safari, please contact us in order to discuss your needs. We will put together a Richtersveld experience that you will always remember and definitely come back to. The facilities inside the Richtersveld National Park has recently been upgraded in the sense that now there are flushing toilets and cold showers along the river and tented chalet camp along the river with hot and cold water as well as ceiling fans for the summer heat.